My son’s playroom was a mess! We had several plastic totes filled with toys, Legos were everywhere, and all kinds of stuff just thrown into the closet. He never wanted to play with his toys, and understandably so. Who wants to search for toys through that kind of mess? I decided to get serious about cleaning it up and my method has really worked! It’s been a year and I’m happy (and shocked) to say that the room is still organized! 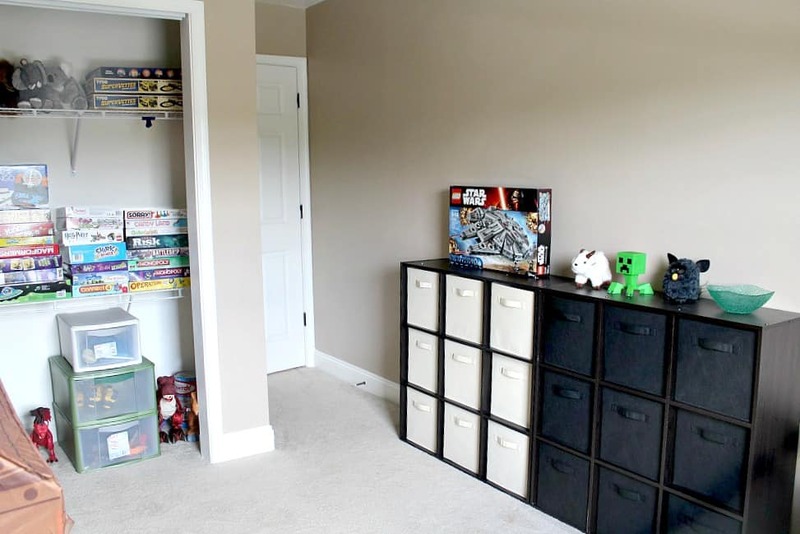 I’ve decided to share my successes so you too can organize a playroom in 3 easy steps! This step takes the longest by far. If your kids have a million Lego sets like mine does, it’s going to take even longer to get them all separated and packaged. Prepare yourself. Pace yourself. If they aren’t into Legos, I think you might just be the luckiest parent in the world! Seriously. I decided to put each lego set into its own plastic zip top bag (except for the really large ones – those went into plastic bins with lids). Then I separated all the toys into groups. We ended up with cars, spy gear, dinosaurs, sharks/boats, Legos, musical toys, board games, trucks, and so on. I wanted to make sure that my son could not only find what he wanted to play with but also be able to reach it himself. First, I utilized the closet for some things. I put toys he rarely/never plays with on the top shelf and the left side of the closet (not visible in the photo). We have a much younger child who may someday want to play with these toys, so we are saving them for now. 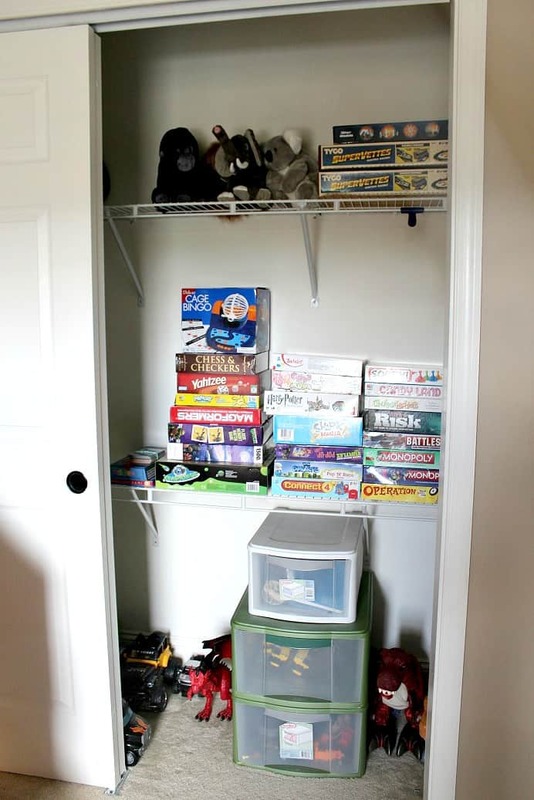 On a lower shelf are all of his board games which are used regularly. And, on the floor, there are a few storage containers with drawers for some of the bigger toys as well as his large trucks. We still have a couple plastic totes, also on the left side of the closet. One has all the pieces for the train set we are saving for my youngest son, and the other has all the pieces to build a race track. 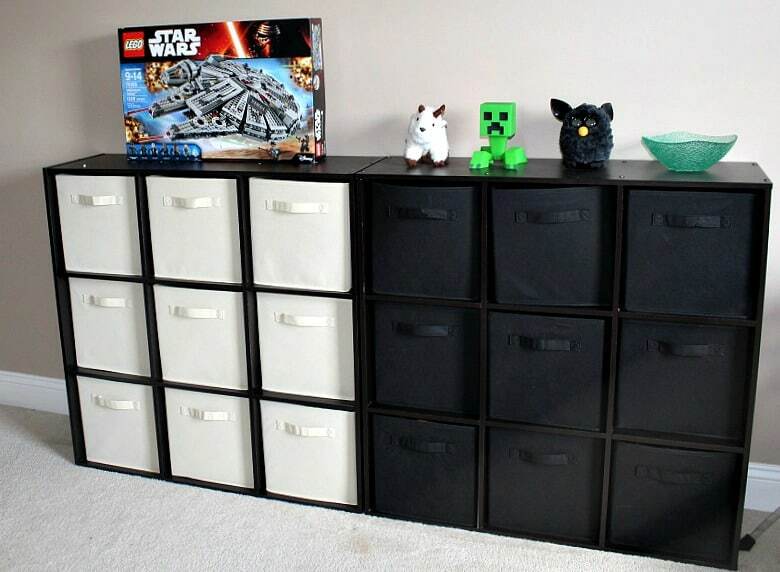 Next, I decided to buy storage cubes and fabric baskets for all the smaller toys I had divided into groups. We needed two cubes and 18 baskets. They are reasonably priced and actually very easy to assemble! One entire cube is dedicated to Lego sets. 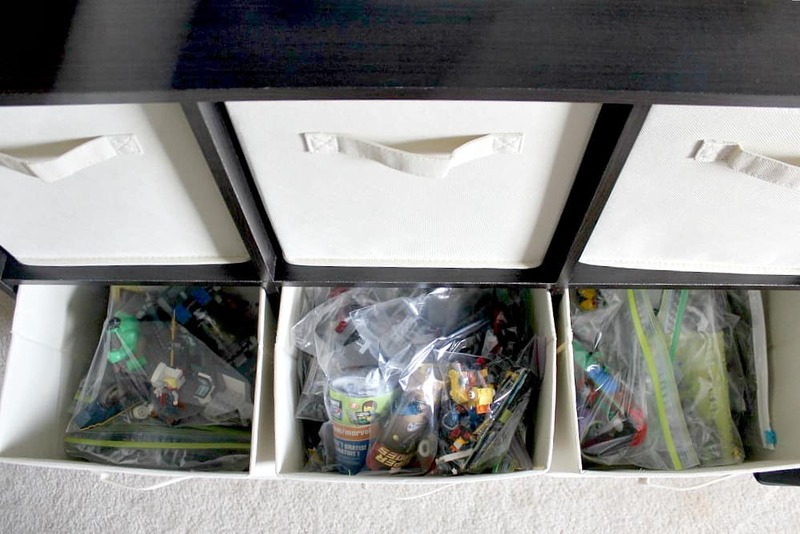 Inside each basket are Lego sets divided by type – Chima, superheroes, dinosaurs etc. The other cube is for all the other toy groups. Some of his favorite toys and larger toys are on top of the cubes. You can label the baskets to make finding certain toys easier. I had to leave them off for now since the little one just peels them off! I opted to buy neutral colored baskets so that if we no longer need the cubes to store toys, we can use them in the kid’s bedrooms, or any other room in the house. I also want to mention that the portion of the room you can’t see in these photos contains a drum set, large train table, a fort, an easel, and a floor lamp. It’s a pretty full room so even a little mess is a big mess! Goodness, I can not say enough how important this step is! After I spent hours getting this room cleaned and organized I didn’t want my son to go in there like a hurricane and mix everything up again, so we set rules from the start. He can only have out one basket at a time and those toys must be completely cleaned up before moving onto something else or leaving the room. I think this way of organizing has worked so well because he doesn’t get overwhelmed with tons of toys being out at once. It also makes the cleaning up process simple so there’s less whining about it – a HUGE plus, right?!? I hope these tips to organize a playroom have been helpful and your kids love their new and improved play area as much as mine does! 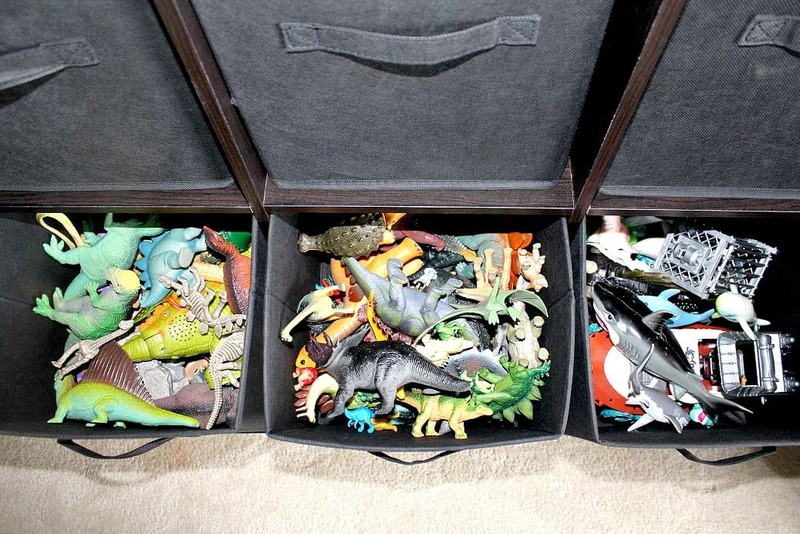 Using the plastic drawers (sometimes with wheels) and the fold able sectioned holders really do make all the difference with separating toys within a larger dresser drawer. We’ve been able to this with not only the legos and action figures but also the video games as well. Things on the bottom and in front are used most often and items at the top and in the back are used less often.